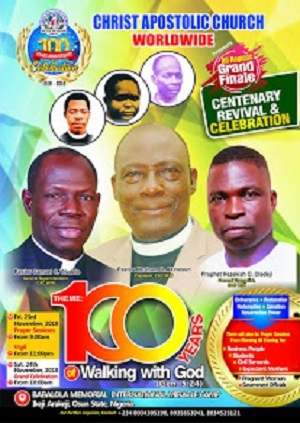 Pastor Gbenga Adelusi is a well known minister in CAC, particularly in the youth fellowship. He is the incumbent DCC Superintendent of Ebute-Metta DCC, Lagos. In this interview with ‘Gbenga Bankole, Pastor Adelusi speaks on time management, negative effect of improper time management in church service, why ministers of God should mastered time management and many more. EXCERPT ! As the name implies, time management connotes the control of time. It is making an efficient and judicious use of time. It is doing what you need to do within the time frame allocated to you without unnecessarily wasting time or without going into irrelevancies because you need to be conscious of people. What is the negative effect of improper time management in church service? It is has a lot of effects because these days the church is at the highly competitive stage. There are churches people go to and they spend one and half hour or two hours in Sunday service. 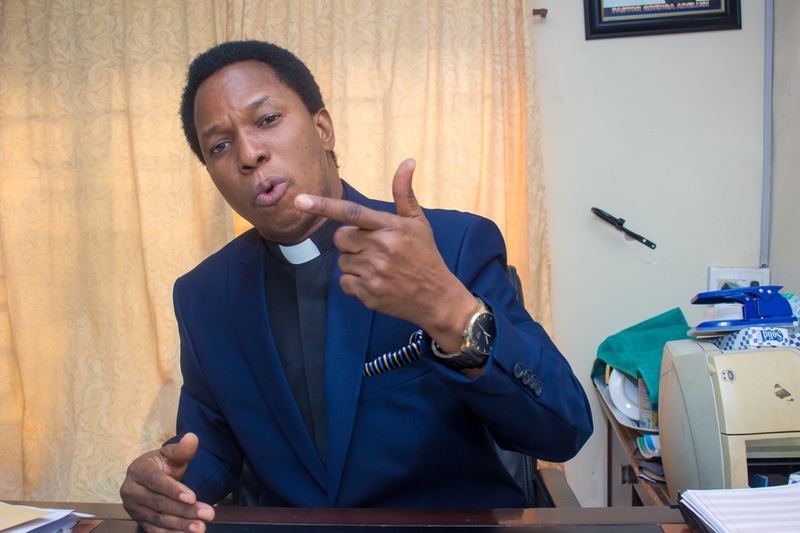 If there is another church that people go to and the Pastor keeps them for four to five hours, members will prefer to go to a church where they will spend lesser time. This is because they believed that they have been going to work from Monday to Friday, while some even go to work on Saturday and Sunday is the only day they have to rest and they don’t want to spend all day in the church. They want to get back home, take some time to rest and prepare for work the following morning. One of negative effects of improper time management in church service is that members will leave the church to another church. It will definitely decrease the number of worshippers in the church. Improper time management in church service deprives us of efficiency and effectiveness in the service of God. Why is it difficult for some ministers to keep to time? Number one is lack of self discipline. The moment some ministers get to stage, they are carried away. They are not disciplined, not time bound and not time conscious. It is the inability to manage oneself. Whoever will manage people must be able to manage himself. Every good leader would be mindful of time because time is very costly. That is why they say time is money. You cannot reverse time once it is gone. Does the Holy Spirit change time schedule in church service? Christ Apostolic Church is a church founded, controlled and led by the Holy Spirit. There are instances that we have seen at times towards the end of the service that Holy Spirit will say people should wait and pray more. But that one is exceptional, it does not happen all the time. The Bible says God is not the author of confusion. Once we start the service and we have committed it into the hands of God, He is in control. Whatever God wants to tell us, He tells within the time that the service is being held. During the service there can be interruption by the Holy Spirit. Probably after the opening prayer or after one of the hymn sessions there can be a prophecy and that probably may not be part of the schedule, we just have to be patient with the Holy Spirit and allow Him to speak. But the leader must know how to make up for that time. Maybe one of the schedules of the service will have to be reduced in order to make up. For example here in Ebute-Metta DCC headquarters, we have slated time for each segment of the programme. We allocate time for opening prayer, hymn session, lesson, announcement and the rest. You cannot just bring in anything that has not been scheduled as part of the programme. We have a time that we start the service and we have a time that we close the service. Education and exposure of the minister are also part of what will determine how effectively he will manage the time. The education I mean is not just in the four walls of the classroom. It is about going out to witness and learn from what happens in other places. Anytime that I am on leave I ensure that I go to other churches to learn. I don’t stay only in CAC. 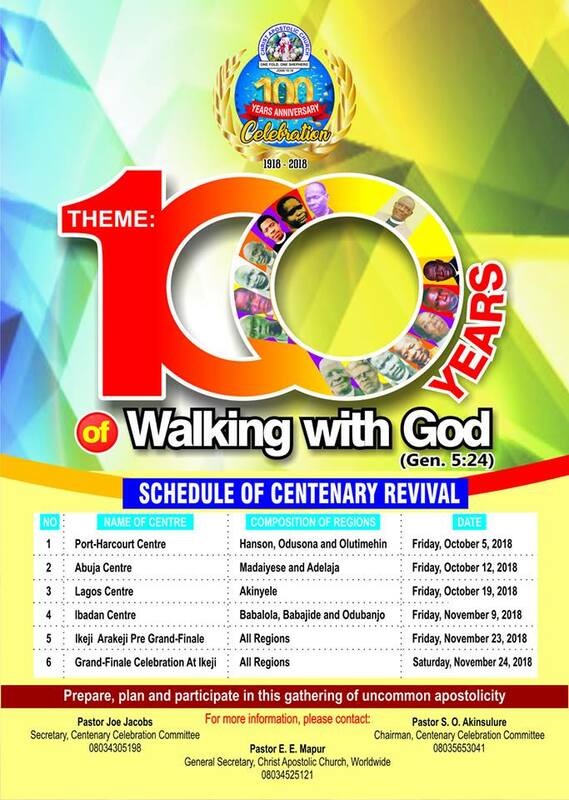 There was a time I was on leave I went to Winners’ Chapel, RCCG and Deeper Life to fellowship with them. I saw the way there are doing things and that is part of education. Some people are not exposed, not educated and not considerate. Every good leader must be considerate and be sensitive. When you are pastoring the church, read their eyes and reactions to know if they are getting bored. Some people are already taking their leave while you are still on the altar. In developed countries like USA and United Kingdom some places of worships are being used by three denominations. Maybe you have been scheduled to use yours from 10am to 12noon, even before 12noon some people are already waiting for you outside to vacate the place because it is their turn to use it from 12 noon. If you go beyond that time they will send you out. I leant how to manage time when I was holding a programme on radio. We call it “Ibukun Ale” on Bond 92.9 FM. When they give me 30 minutes, 5 minutes to that time they will be giving me sign, and immediately it is that time they will ask me to stop and if you don’t stop you are off the air. So you cannot afford to go beyond that time. In the university one of my lecturers told me that there was an African preacher who went to preach in USA and you know that out there they don’t joke with time. The preacher was told the time he was to round off, but he thought he was in Nigeria, he didn’t keep to the time and they had given him sign to stop, but he didn’t yield. He never knew that the pulpit was collapsable. As he continued preaching the pulpit sank to the basement. His Bible and everything sank to the basement. He was surprised and asked that what happened and he was told his time was off. That was how he was forced to end the message. We need to learn in Christ Apostolic Church. We waste peoples’ time unnecessarily. An announcement that could be made for 10 minutes will be made for 20 minutes. They will be laying unnecessary emphasis, repeating what they have said again and again. The curate will make announcement. The Senior Pastor will come again to make same announcement and even the Superintendent. At Ebute-Metta DCC headquarters we have projector which we use to display our announcements for people to see on the screen. People are reading it even as the service is going on before announcement segment. We also have bulletin and we have announcement on it. Due to this, we don’t have much to say. People can read it on the screen and on the bulletin. We just touch the necessary ones. It shouldn’t be more than five or ten minutes for the announcement. What is your advice to CAC ministers on proper time management, particularly revivalists or Prophets? Improper wasting of time is common among church planters. Church planters believe they are all-in-all in their church and they can do whatever they like and it is affecting the church. It is giving the church a very bad image to the outside world and people are leaving their churches. It is only those who are ignorant of the word of God they keep captive. If a Prophet is invited to our church to minister, I give him time and he must not go beyond that time because when it is getting to that time I will send message to him to round off. Lack of training is the major reason they are wasting time unnecessarily. Leadership and time management is very important. My advice to them is that they should be time conscious and self disciplined and be considerate. They need to consider people they are leading. Majority of us (Pastors) live in the church premises so we need to consider members of the church who are living in far places especially in Lagos where we have gridlocks everywhere. When the minister of God is already in the mission house eating or resting, some members of the church are still on the road due to traffic. In our church we have people who come from Ikorodu, Mowe and Lekki to worship here. If you delay them, they are going to meet traffic on the way and they will get discouraged, next time they won’t want to come. Ministers need to consider people like that. As a youthful pastor, what is your advice to youth leaders who waste time unnecessarily during youth fellowship programmes? Youth leaders who have that kind of attitude can still be trained. They need to be taught about time management. I have it in mind that one of my messages to the church this year is “Christians and Time Management.” It is not only leaders that need to manage the time effectively, even Christians need to do so. The Bible says the time is short. The time we have even to live in this world before Jesus Christ will come back is very short. We should not waste out time on irrelevancies. We should be focused and purposeful and have a vision. When you have a vision you will be time conscious because you know that you have a pursuit. So you cannot waste your time on frivolities. Those youth leaders need to be sensitive and time conscious and time bound. They should train and discipline themselves not to waste peoples’ time. Now that Ebute-Metta has been upgraded to DCC status, what is your vision for the DCC? It is not like a paradigm shift because the church of God is still the same. All these things are just nomenclature, designation and names. It has not changed the goal and purpose of the church. The purpose of the church is for worship, evangelism, education and fellowshipping. We can say we are going to pursue the goal on a higher pedestal. We need to expand. We need to evangelize. We need to win more souls into Christ's Kingdom. The Bible says to whom much is given, much is expected. Now that we have been upgraded to DCC we are expected to evangelise more. 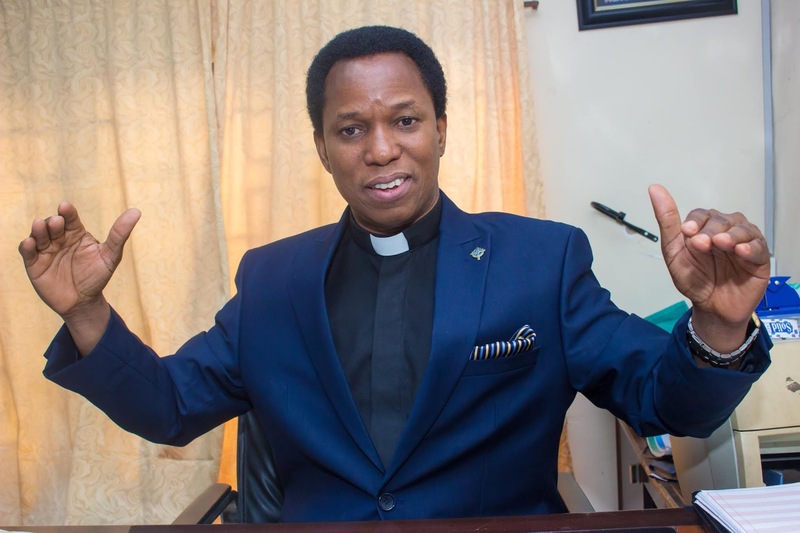 We are not expected to relax and say “yes we have arrived.” We are to evangelise the more, win more souls and plant more churches so that within our DCC new districts and zones can emerge or be carved out as a result of expansion. We should not rest on our oars or be complacent. The work continues. CAC Ebute-Metta DCC inaugurated a central Bible study programme early this year. We have put lectures together in print and that is what is going to be used in all assemblies under Ebute-Metta DCC, just as CAC Worldwide is doing with Sunday school pamphlet. It is centralized and unified. The reason is because the state of Bible study in CAC today is disheartening. When it is time for prayer revival you will see crowd, but when it is time for Bible Study only very few people will attend. Why is it like that? When the Bible says God exalts His word above every other thing. The Bible says "Your Word I have hidden in my heart that I may not sin against You." Without the word of God how can we make Heaven? How can there be revival, holiness or restoration without the word of God? We need the word of God. We need the revival of the word of God and we want God to revive the Bible Study programme in our DCC. I know it is not generally practiced in CAC, but we are starting here. The unified pamphlet will be used in all assemblies under our DCC. What is the measure you have put in place to ensure that it is effected in all assemblies under your DCC? Through the District Superintendents we have educated all our Pastors. We have let them know that this is true revival. Revival is not about gathering people and raising money. Revival means restoration, repentance, renewal etc. We have told our Pastors this Bible Study porgramme is very important and they must observe it. Even if they are holding revival programme this should still come in. What is the purpose behind the establishment of “School of Discipleship and Leadership Studies” by Ebute-Metta DCC? It is in a bid to equip the church through the word of God. Jesus Christ says “go and make disciples of all nations.” There is a difference between a new convert and a disciple. A disciple is someone having accepted Jesus Christ as his Lord and personal savior, he’s now equipped with the word of God to follow and serve Jesus Christ. That goes beyond what you give them at baptismal level or preaching on the pulpit. There are some doctrines and lessons of the Bible members of the church ought to know. There are some theological teachings of the Bible that are not meant for Pastors who are called into full time ministry only, even members of the church needs to know them. In this institute we teach people how to preach. We encourage members of the church to preach. 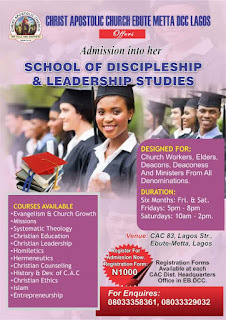 We teach courses like Homiletics, Hermeneutics, History & Development of CAC, Systematic Theology, Christian Education, Christian Leadership and lot more. Six months and it is weekend programme which is Friday and Saturday. The first semester is three months, while the second semester is also three months before they will graduate.